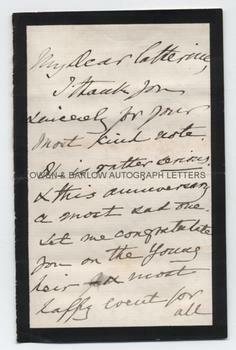 SIR THOMAS GLADSTONE AUTOGRAPH Letter Signed. British Tory (later Conservative) M.P. Elder brother of Prime Minister, W. E. Gladstone. ALS. 2pp. Fasque. August 3rd 1885. 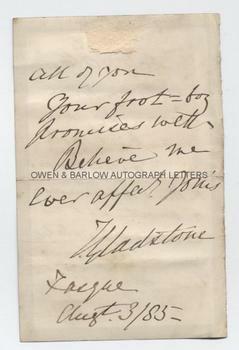 To Catherine [Gladstone], wife of W. E. Gladstone. "My Dear Catherine, I thank you sincerely for your most kind note. Ol - [?] is rather serious & this anniversary a most sad one. Let me congratulate you on the young heir - a most happy event for all of you. Your . . . [?] - boy promises well. Believe me, ever affectionately yours, T. Gladstone." 12mo. Approx 6 x 3.75 inches. Lacking integral blank leaf. Slight mounting traces at top edge of verso. Very good. Sir Thomas Gladstone writes to his brother's wife to congratulate the couple on the birth of "the young heir", William Glynne Charles Gladstone, who was born on 14th July 1885, to W. E. Gladstone's eldest son, William Henry Gladstone.